Editor’s Note: Building on our agriculture technology trends research, last week we released our latest report, the Mid-Year 2016 AgTech Investing Report. You can find all of AgFunder’s research here. Investment into agriculture technology startups fell 20% year-over-year in the first half of 2016, as 307 funding deals collected $1.75 billion. It coincided with a 14% year-over-year decline in the amount of investment recorded across the global venture capital markets, according to the Venture Pulse report. This first half pullback continues the trend for falling investment figures that started in the fourth quarter of 2015. The Venture Pulse report blamed the pullback on a “wait-and-see” approach among venture capitalists due to various market uncertainties including Brexit, the November presidential election in the US, a slowdown of the Chinese economy, and a potential interest rate hike in the US. We believe that problematic valuations and down rounds have also made VCs skittish on the global stage. The creation of a record-breaking number of unicorns in 2015 — companies valued over $1 billion — is also causing caution, according to the report. In agtech specifically, there is also a wait-and-see approach from venture capitalists, but for a different reason. Some firms have made their first few investments and are keen to see how they will play out before investing further. The hype surrounding some agtech subsectors has also died down. In Food E-Commerce, the growing number of failures, closures and consolidations have pushed many investors to pullback from the sector which in our view was very overheated in 2015. Investors also pulled back from ag-focused Drones startups, as farmers have questioned their efficacy and efficiency on the farm in their current form. The first half of 2016 also saw 7% more deals closed than in H1-2015 (285) and 25% more than in H2-2015 (245), compared to a 13% fall in the number of venture capital deals globally. The number of investors placing bets in the sector also climbed 52% year-over-year to 425. Together, these data highlight the growing number of entrepreneurs and investors that are engaging with the sector, coming to it from a range of different industries to capitalize on the attractive fundamentals of the agriculture sector. It’s also worth noting that if we exclude Netafim’s $500 million in debt financing as an outlier from the H1-2015 data, we would have actually seen single-digit dollar growth during the period. We noticed some maturing in the sector too, as Series B deals raised more funding across more deals compared to 2015 levels, while seed stage deals still dominated activity. The geographical diversity of the sector also grew, with startups from 39 countries contributing to the final figures. The US captured 53% of all deals in H1-2016, down from 58% in 2015, and some new or rare countries in the sector included Costa Rica, Portugal, Finland, Russia, Turkey, United Arab Emirates, Denmark, Indonesia, and Ecuador. Find more in-depth reporting on H1-2016’s agriculture technology trends in the report by downloading it here. Below are some of our high-level takeaways. Not only did the number of deals increase on 2015 levels, but 425 different investors participated in the market during the first half of 2015. That’s over half the number that contributed to funding during the whole of 2015 (672). Generalist accelerators also paid increasing attention to the sector, particularly SOSV, which invested in 26 startups that took part in its biotech-focused IndieBio and Food-X programs. A growing number of corporate venture firms drove investor numbers too, particularly those in the food industry and other tech sectors. Accel Foods made three bets with Exo Protein Bars, Cornershop, and Ninjacart; Campbell Soup’s Acre Venture Partners, which closed in March, invested in Back-to-the-Roots, General Mills invested in alternative protein company Kite Hill, McCain Foods invested in ag imagery analysis company Resson, Yamaha Motor Ventures invested in PrecisionHawk, and Robert Bosch’s venture arm invested in The Yield and CropX. These new investors will play an important role particularly at the later stages of investment. In this report, we added a new section tracking all the food and ag-focused funds that had opened or closed during the half. Those that closed include Anterra Capital’s $125 million growth stage fund, Avrio’s $110 million Fund II, and New Crop Capital’s $25 million plant-based technology fund. We also detail four more that have started fundraising this year, collectively targeting over $320 million. Soil & Crop Technology startups, which encompasses fertilizers, pesticides, seeds, soil supplements and more produced using chemical, biological and genetic processes, had a good H1, raising $164 million in funding across 21 deals in H1-2016. This was just $9 million less than the subsector raised during the whole of 2015 ($173m). Some of the period’s largest and most exciting deals were for biological input technologies, particularly those created through research of the plant microbiome. Indigo, which recently came out with a seed coating product to help mitigate the impact of drought, raised $56 million in Series B funding during the first half from incubator-VC Flagship Ventures (a deal that was followed by a whopping $100 million Series C in July) and PivotBio raised $16 million in a secretive Series A round. Other types of biological products also raised significant funding such as BiOWiSH Technologies’ $5 million Series B, Cool Planet’s late stage $9 million round, Inocucor Technologies’ $6 million Series A, and Terramera’s $10 million Series A.
Gene-editing is another trend in the Soil & Crop Technology segment that’s gathering attention. While nothing new, the advent of CRISPR Cas-9 has pushed gene-editing technologies into the limelight, and they’re starting to raise a lot of funding for medical and agricultural purposes. Caribou Biosciences, which was founded by Jennifer Doudna, one of the inventors of CRISPR Cas-9, raised $30 million in Series B funding from two agtech-focused VCs — Pontifax AgTech and Rabobank’s Anterra Capital — as well as some other generalist VCs. In keeping with past agriculture technology trends, investment in precision agriculture startup kept up in the first half of 2016. Startups in this segment raised $333 million during the first half of 2016 across 58 with 99 different investors. This was nearly exactly half what was raised across the whole of 2015 ($661m). The makeup of this segment, which we draw from the larger Drones & Robotics, Decision Support Tech, Irrigation & Water, and Smart Equipment & Hardware categories shifted during the first half, however. Drones, in particular, represented a smaller portion of the precision ag segment versus 2015 taking 34% of precision ag funding versus 49% in 2015, making way for more software startups, which raised $92 million across 19 deals taking 28% of the pie versus 11% during 2015. In our 2015 report, we reported on some of the concerns farmers had around the efficacy of drones for their operations, and it looks like some investors have taken those concerns on board and are waiting for them to play out. Having said that, there was still a larger number of deals during the first half of 2016 (26) than the first (25) and the second half of 2015 (16). This reflects the new wave of entrepreneurs and technologies entering the space. Many of those in these early stages are aiming to solve some of the issues mentioned above, such as SlantRange, which raised $2.7 million in seed funding for its drone sensor technology that is vehicle-agnostic and aims to reduce processing time and increase accuracy. The largest software deal was Farmer’s Edge, the Canadian startup which raised $44 million across two funding rounds during the half at Series C stage. FarmLink came next with a $24.6 million funding round. A growing emphasis on the need for high-quality data saw successful funding rounds for sensor startups like aquaculture-focused business The Yield, and ground- level weather data startup Understory, and pest detection startup SemiosBio Technologies. 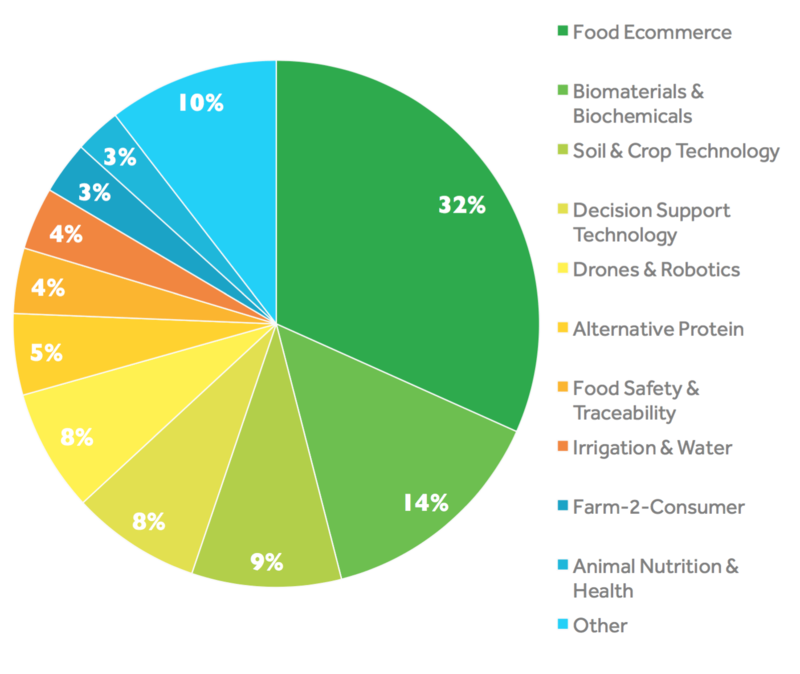 A greater number of agtech startups matured during the first half of 2016, with 29 deals raising $449 million. This was a 50% increase in funding dollars at Series B on H1-2015 and a 60% year-over-year increase by the number of deals. It also saw startups at Series B stage raise more than at Series A, a shift from 2015. The total Series B funding dollars were slightly inflated by Thrive Market’s $111 million round, but even when you exclude that deal, overall Series B investment was still up; there were other weighty deals during the half such as microbial seed coating company Indigo’s $56 million raise and Modern Meadow’s $40 million deal. Series C funding was more muted, and companies at that stage raised 18% less than the same period last year, which could be down to offputting high valuations at some startups. Looking ahead to the rest of 2016, we expect full year investment levels will come in lower than 2015, as continued caution (and perhaps discipline) is exercised in some of the subsectors that were growth drivers in 2015. To read more about agriculture technology trends from the first half of 2016, access the full report here. If you have questions or want to use our research, please get in touch at [email protected].